This textbook is an interesting addition to the primary care focus on diabetes management. The title is a little misleading however, as I had expected management of type 1 diabetes to be included but the focus appears to be purely on type 2 diabetes. Gestational diabetes, which is often discovered in primary care by community midwives, is not mentioned. Written in small sub sections, this book introduces topics but does not offer the level of detail expected to enable primary care practitioners. 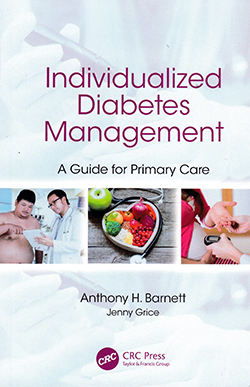 The textbook also labels people living with diabetes as ‘patients’, which is not the term promoted with primary care practitioners who work alongside people living with diabetes. What was good were the sections tackling perceived clinical inertia and encouraging practitioners to have the courage to escalate care in appropriate ways in a timely fashion. Some of the figures and textboxes are hard to read as the book has been published in a small font and a reduced size – perhaps to fit in a pocket for practicality? Additionally, illustrating potential complications with black and white photos and treatment decision-making does not do justice to the message being conveyed. An interesting textbook with useful cases presented towards the end in the Personalised Management chapter.